Rustic charm and beauty will fill your home with the addition of this handsome end table. 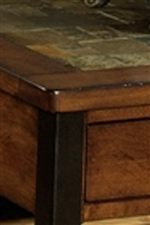 Lightly distressed Cherry Tobacco finish is brought out by antique bronze metal legs and drawer pulls. A slat designed shelf and a drawer makes it easy for you to store your TV remotes and magazines neatly beside your sofa for a country chic look. Inset solid natural slate tiles add the perfect finishing look to pull the beautiful design of this piece together. The 3013 End Table with Drawer and Shelf by Null Furniture at SuperStore in the Williston, Burlington, VT area. Product availability may vary. Contact us for the most current availability on this product. Rustic and country chic, this 3013 occasional table collection is the perfect addition to your living room with its handsome style. Each piece has ample storage room for you to store your TV remotes and magazines neatly out of sight, but still within arms reach of your sofa and chairs. 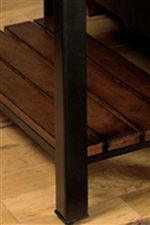 Antique bronze metal legs and hardware accent the lightly distressed Cherry Tobacco finish on each of the pieces. To complete the stunning look of each piece, inset solid natural slate tiles add a unique finishing look that you are sure to love. The 3013 collection is a great option if you are looking for Cottage furniture in the Williston, Burlington, VT area. Browse other items in the 3013 collection from SuperStore in the Williston, Burlington, VT area.